We’ve got the goods on calling Gwangju. 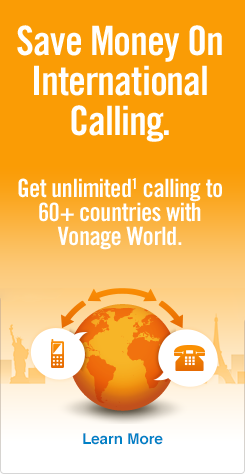 Well, Vonage World now includes South Korea! For one low monthly rate, you’ll get unlimited¹ calling to Gwangju! And we know you’re wondering, “Does Vonage World allow me to call Gwangju mobiles?” Does South Korea make the world’s best kimchi? Yes and yes! Vonage World lets you call mom, dad and whomever else in Gwangju (and the rest of South Korea), whenever you want for however long you choose¹! Not only has South Korea been added to Vonage World, this South Korea calling plan covers calls to landlines and mobiles and is the only plan that truly lets you call Gwangju unlimited¹. Now you know the plan for calling Gwangju with (Vonage World), but do you know how to call Gwangju? Start with 011 — the exit code for the U.S. and Canada. Next, enter 82 — the country code for South Korea. Then, dial 2 — the Gwangju area code (landlines only*). Finally, wrap up with the local 6–8 digit Gwangju phone number. *When calling mobiles in Gwangju, enter the U.S./Canada exit code, the South Korea country code and then “1” before dialing the 6–12 digit mobile phone number. Do you know how to dial other major cities in South Korea? Read up on how to call South Korea from the U.S. to learn more! Gwangju, also known as Kwangju, is a city located at the base of Mount Mudeung. Gwangju was an industrial hub centered around the automotive industry in the 1960s but it has been greatly transformed in recent years. Gwangju’s economic focus has shifted to more high-tech fields like IT and telecom. The city is also home to Guus Hiddink Stadium, named in honor of the Dutch coach who led the South Korean national team to the 2002 World Cup semifinals.